A term of Gnostic magic, of uncertain etymology. According to Irenæus ("Adversus Hæreses," i. 24, 3-7), the Gnostic Basilides (died about 130) gave the name of Abraxas to the highest Being, who presides over the 364 kingdoms of spirits (52 x 7 = 364), because the numerical value of the letters of this name is equivalent to 365 (a = 1, b = 2, r = 100, a =1, x = 60, a = 1, s = 200)—i.e., the 364 spirits + the Highest Being Himself. In a magic papyrus it is expressly stated that Abraxas is equivalent to 365, the number of days in the year (Wessely, "Neue Zauberpapyri," p. 56; Dieterich, "Abraxas," p. 46). Bellermann ("Versuch über Gemmen mit Abraxasbild," Berlin, 1817-19, derives this word from the Coptic. He claims it is a compound of Abrck and sax, meaning "the holy Word," "the blessed Name." See, on the other hand, Baudissin, "Studien zur Semitischen Religionsge-schichte," i. 189, note 1. Other etymologies and a summary of all investigations in the matter are given by Matter in his "Histoire Critique du Gnosticisme," 1828 (German trans. by Dörner, ii. 56 et seq., Heilbronn, 1834). Güdemann sees in Abraxas some connection with the magic formula of the papyri, "arbathiaoth" (which he identifies with ), the four-lettered name of God ("Festschrift zum Achzigsten Geburtstage Moritz Steinschneider's," p. 15). Moïse Schwab suggests that Abraxas is the equivalent of ("the Father created") ("Vocabulaire de l'Angélologie," p. 383). Geiger suggested a derivation for Abraxas from the Hebrew ha-berakah ("the blessing"); this is approved by King, "Gnostics," p. 251, but rightly rejected by Krauss in Pauly-Wissowa, "Realencyklopädie," p. 7. 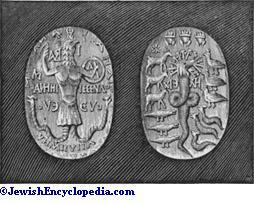 Abraxas God (Gnostic Gem, Obverse and Reverse). As has been shown by Schmidt ("Gnostische Schriften in Kopt. Sprache," pp. 562 et seq. ), Abrasax stands in no organic connection with the Basilidiansystem and its 365 worlds corresponding with the numerical value of the Greek letters of Abrasax. Like Barbelo and other similar names mentioned by Priscillian, Abrasax represented a demiurge, a divine potency elevated by some heretic sect to the position of a god. From the papyri and the magic gems it is certain that the word refers to the use of the Ineffable Name as a master-key with which the powers of all the upper and the nether world are locked or unlocked, bound or loosened, by the great Manda da Haye (Wisdom of Life = God). Now there occurs in the mystical writings the name Raza Rabba ("the Great Secret"), met also in the Cabala under the name of Raza de Razin ("Secret of Secrets"). This suggests the etymology from Ab Raza, "Father of the Secret," which is the same as "Master Secret." See Brandt, "Mandaeische Schriften," pp. 143 et seq. ; "Mandaeische Religion," pp. 213 et seq. Abraxas (Gnostic Gem, Obverse and Reverse). It is evident that the last two lines ought to be read Ablanathanalba, which Baudissin (l.c. 202) has overlooked. 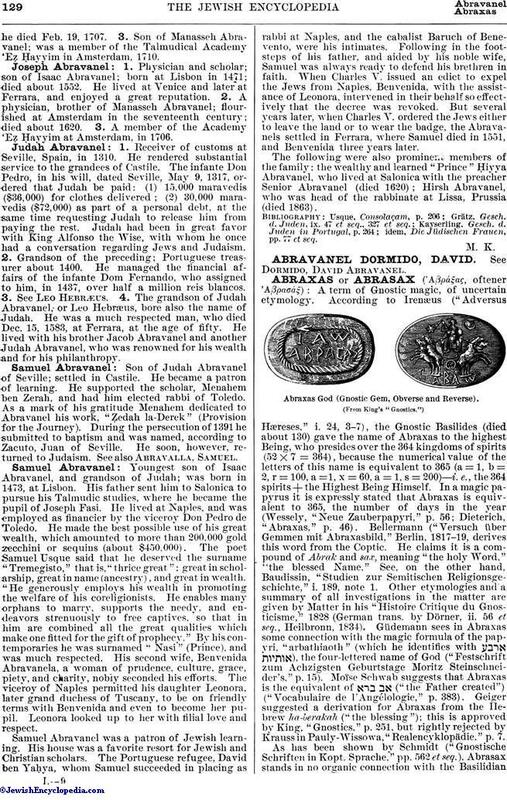 From the examples adduced it is evident that Abraxas probably means "holy name," seeing that it is often attached to divine appellations. 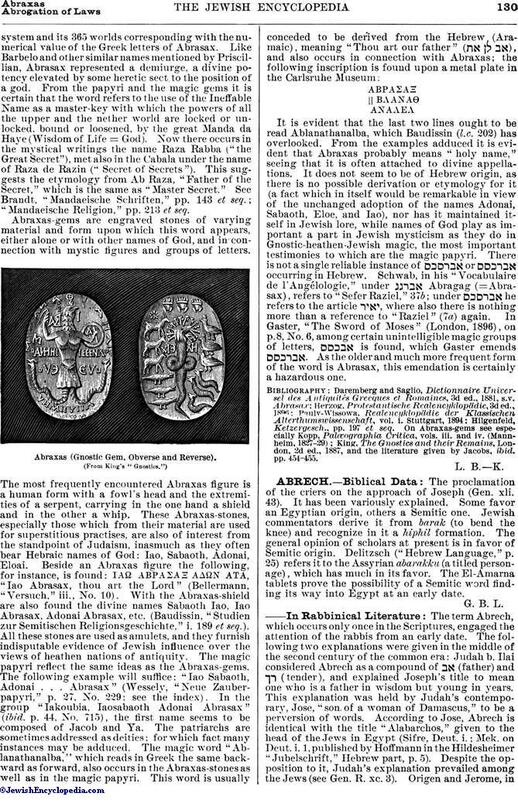 It does not seem to be of Hebrew origin, as there is no possible derivation or etymology for it (a fact which in itself would be remarkable in view of the unchanged adoption of the names Adonai, Sabaoth, Eloe, and Iao), nor has it maintained itself in Jewish lore, while names of God play as important a part in Jewish mysticism as they do in Gnostic-heathen-Jewish magic, the most important testimonies to which are the magic papyri. There is not a single reliable instance of or occurring in Hebrew. Schwab, in his "Vocabulaire de l'Angélologie," under Abragag (= Abrasax), refersto "Sefer Raziel," 37b; under he refers to the article , where also there is nothing more than a reference to "Raziel" (7a) again. In Gaster, "The Sword of Moses" (London, 1896), on p. 8, No. 6, among certain unintelligible magic groups of letters, is found, which Gaster emends . As the older and much more frequent form of the word is Abrasax, this emendation is certainly a hazardous one. King, The Gnostics and their Remains, London, 2d ed., 1887, and the literature given by Jacobs, ibid. pp. 454-455.